Thanks to BCNS, Sandwell College can now be confident that all its systems and data are securely backed-up and can be recovered with ease. 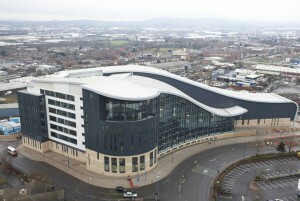 The college is one of the main further education providers in the West Midlands. It attracts students from across the region, offering a diverse range of courses in everything from motorsports to multimedia. In spring 2012 the college moved into an iconic new £77m building in central West Bromwich, consolidating three campuses into one. The college had struggled for some time with a range of disjointed and unreliable back-up systems which presented a risk to the recovery of data in the event of a system failure. This, coupled with the preparations for the move to the new campus, led to the decision to find a more reliable and efficient solution. The challenge was to achieve a stable, centralised system that would back-up data from across the entire network, including physical and virtual (VMWare – vSphere) servers, regardless of the platform. The skills that BCNS could provide were well-known to Amir Kanwar, Head of Network Services at the college. We had previously helped design and implement an e-mail, log-in and file storage system for Sandwell’s students, accessible from anywhere across the three campuses – so Amir was happy to call on our services again to help create the new, streamlined back-up system. The system we recommended was WD Arkeia Network Backup. Fast and easy to use, the WD Arkeia system is ideally suited to an organisation of Sandwell College’s size. It also gives the benefit of supporting more than 200 different platforms – useful for the college, which uses a mix of Microsoft, Novell and Linux systems. As a WD Arkeia Premier Partner, BCNS knows the technology well and was able to supply and install it with minimal disruption. Ensuring the system could be used to the full was vital, so we also provided on-site training for the college’s three-strong network team. Since the project was completed in spring 2010 the results have been impressive: a fully-functioning, reliable back-up system, fit for one of the country’s leading FE colleges.